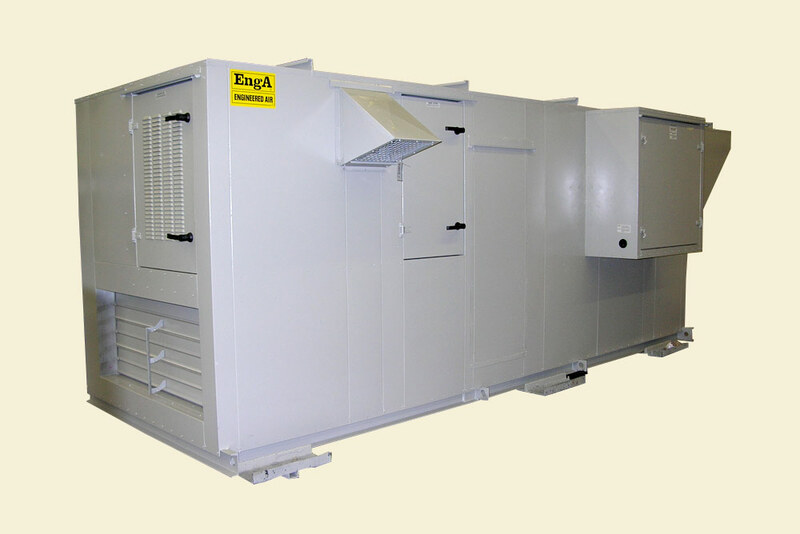 Engineered Air manufactures a variety of products that can be used for dehumidification. Our PD Series of Pool Dehumidifier units cool, dehumidify and reheat air from pool areas. They can also incorporate heat recovery of the exhaust air for additional operating cost savings. Return air fans and/or mixing boxes can be provided when required. Auxiliary Engineered Air heating components (DJ, DG, electric, water, or steam coils) can be added to give a complete package. Free cooling packages including motorized dampers (outside air, return air and exhaust air), as well as all economizer controls are available. Whirlpool de-superheaters (selected for higher pool water temperature) are available. Exhaust air heat reclaim systems using air to air, or heet pipe coils air available. Evaporating from the surface of an indoor swimming pool causes two major concerns. The first and most obvious problem relates to the resulting high relative humidity level. During periods of low outside air temperatures, high indoor humidity causes problems with condensation and frost on windows. A more serious problem could result if moisture penetrates into the building structure, where it could condense and freeze thereby causing structure damage. The second major concern is heat loss from the surface of the swimming pool. As moisture evaporates from the surface of the pool, a large amount of heat is lost as the latent heat of evaporating is carried away by the moisture. If the humid air was simply exhausted, all of this latent heat would be lost and would have to be replaced by heating the pool water. Reduced pool heating costs due to reclamation of latent heat of evaporating from pool surface. Reduced space humidity levels prevents possible structural damage due to condensation. Space comfort conditions are also obviously improved by the lower relative humidity level. If a remote (outdoor) air-cooled condenser is used, the resulting space cooling ability also has obvious benefits. 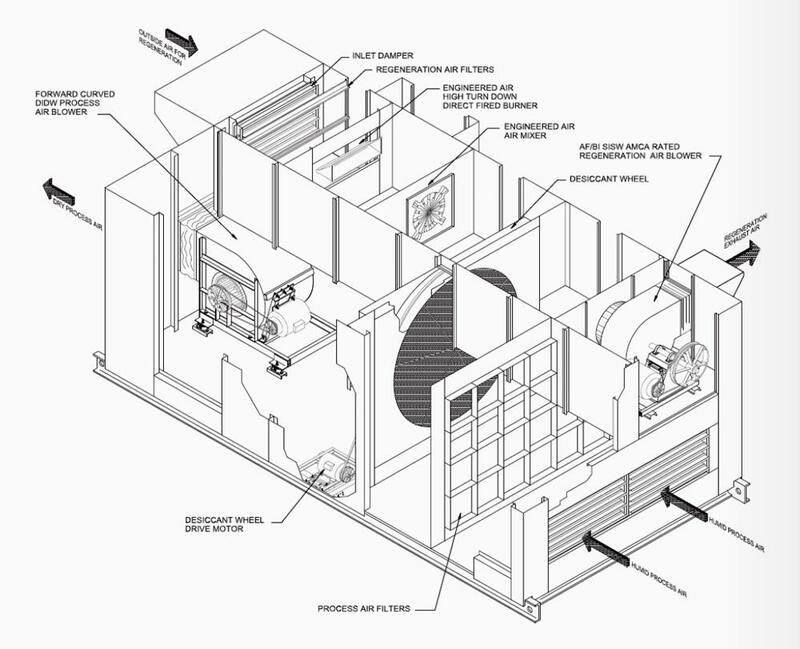 Engineered Air manufactures a variety of products that can be used for dehumidification. Our CD Series of Ice Rink Dehumidifier units solve the condensation problems frequently encountered in skating and curling rinks. A common problem encountered in skating or curling rinks is fog and / or moisture condensing and dripping from the structure. This occurs during periods when the space temperature is low and moisture content of the air relatively high. Condensation problems can occur throughout the year but more frequently occur during the spring and fall seasons. In pool environments, outside air can often be used to condition the space and reduce the moisture level. This approach cannot be used in a rink environment because the outdoor air contains moisture with a higher dewpoint level than the indoor temperature of the rink. As a result, bringing in outdoor air for ventilation only adds to the fog and condensation problems. The solution is to remove moisture from the ice rink air by using an Engineered Air dehumidifier. Our CD Series is one option. One alternative is the DWD Desiccant Gas Fired De-humidifier by Engineered Air. Engineered Air is the proven leader in combustion and heat exchanger technologies. Our high turndown burner and floating, stress relieved heat exchanger have been quality tested for over 25 years of use involving thousands of installations. Dedicated Engineered Air controls, specifically designed for EngA Burners, are used to achieve up to 15:1 fully modulating turndown ratio. The ability to modulate the combustion process, while maintaining or increasing the efficiency throughout the turn down range, results in the lowest energy cost per pound of steam produced. This recognized combination of Engineered Air TRAC controller, burner and heat exchanger is further enhanced to achieve minimum capacity duration at high altitudes. Control of humidity in a conditioned space plays a major role in providing occupant comfort and in optimizing eletronic equipment performance. Many people, when they think of humidity control, think dehudification, but for a large part of North America, humidity control also means humidification (adding water) during part of the year. Studies have showm that thermal comfort can be achieved at lower temperatures if the humidity levels are maintained at proper levels. Low relative humidity increases evaporation from the skin giving the impression that the air temperature is lower that it actually is. The nose and throat will also see increased levels of evaporating, which can cause drying of the mucous membranes in the respiratory system. All-air systems are particularly sensitive to low humidity levels, because the forced air movement can amplify the effects of evaporation. While human comfort is maximized between 30&percnt; and 60&percnt; relative humidity, bacteria, viruses and biological organisms suffer. The influenza virus for example, has the highest mortality rate at 50&percnt; RH with its survival rate increasing at higher and lower humidity levels. Operation of electronic equipment may be adversely effected when subjected to relative humidity outside the optimum range for humans. Generally this equipment is designed to operate between 35&percnt; and 55&percnt; RH. Industrial processes and material storage facilities are also sensitive to humidity. Designers of such applications should be familiar with the effect of humidity on their systems, equipment and materials. At the initial start up, the evaporating tank is filled with water to the operating level. On a call for humidification, the modulating power burner is fired in the heat exchanger to provide the required amount of steam. Electronic water level monitoring automatically enables the make up water valve. The uncontaminated steam generated in the evaporating tank flows through the steam hose or piping to the stream distribution system where the steam is dispersed into the supply air stream. Engineered Air EngA-Sorb Stainless Steel distributing manifolds are fitted with metering orifices which extend towards the center of the tubes, insuring only the driest steam is injected into the air stream. Each distribution tube is sized for its required steam flow. It is critical to have a uniform air velocity profile across the steam distribution grid. Air handling applications require the effective distribution grid size to closely match the upstream coil face dimensions. If this is not possible, an adequate transition needs to be incorporated between the coil section and the steam distribution grid. A minimum distance equal absorption or non-wetting distance has to be maintained downstream of the distribution grid before coming into contact with other components. Engineered Air's HE / DWD Series of fully packaged process / industrial units are ideal for removing moisture in a variety of applications, even in low humidity conditions. Indoor and outdoor models are available. 1500 to 15000 CFM process air. Lightweight, thermally and chemically stable, high performance and low maintenance desiccant wheels using activated silica gel for effective moisture and adsorption even in low humidity conditions. Sizes available to dehumidify the process air below 40°F dewpoint and remove up to 470 lb/hr moisture @ 60°F DB / 90%RH. High efficiency Engineered Air 20:1 high turndown Green Burn direct-fired burner used for desiccant wheel regeneration. EngA air mixer enhances moisture removal by providing thorough air coverage onto the face of the desiccant wheel. The Engineered Air HE/DWD Series gas fired desiccant dehumidifier uses vapor pressure differential to absorb moisture on the relatively cool process air side and then drive this moisture off in the hot regeneration airstream. The process air is hence dehumidified. 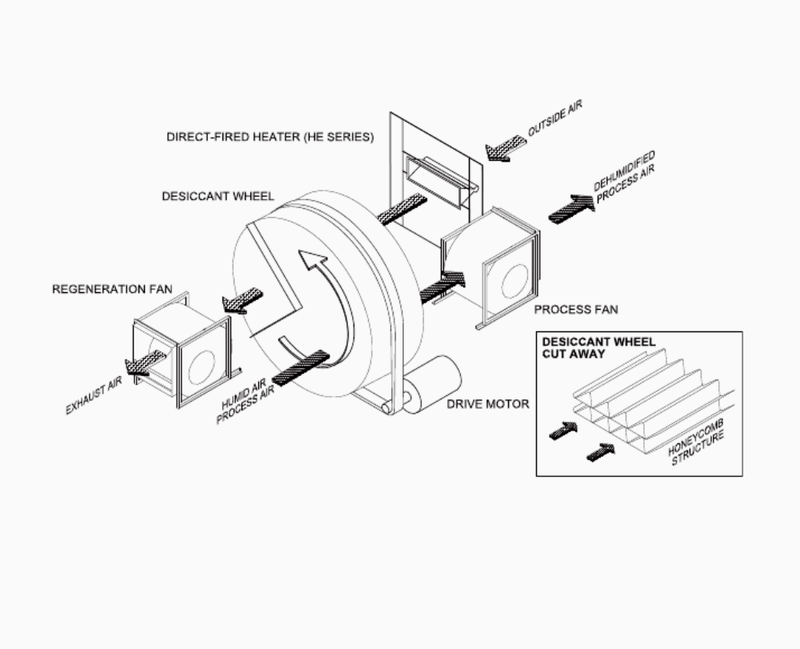 The desiccant wheel rotates constantly through the process air and the regeneration airstreams. 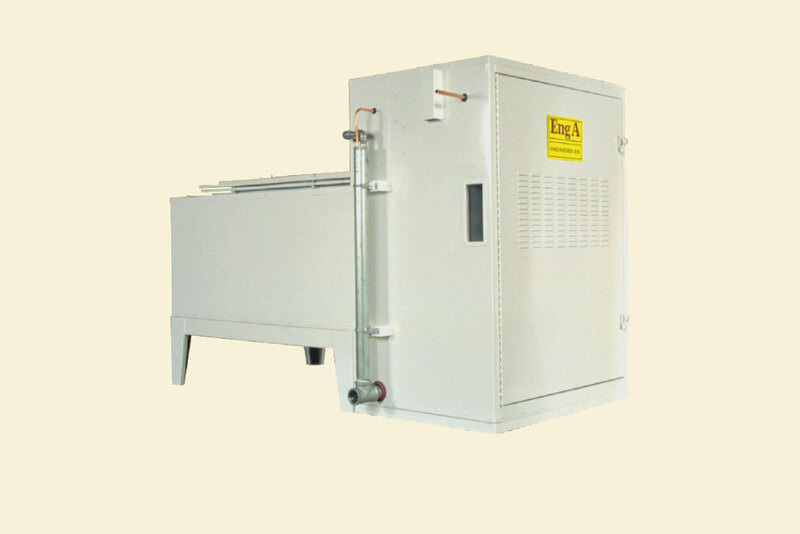 The ambient regeneration air is heated by an Engineered Air direct fired burner (HE Series). The water molecules transferred from the process air are then discharged to the ambient. Gas fired dehumidification units do not have a DX coil and inherent freezing problems associated with a low temperature DX coil. With mechanical cooling dehumidification, the condensed moisture will freeze on the surface of the evaporating coil when the coil surface is below 32°F as is sometimes necessary to reach low dewpoint levels. As a result, the minimum achievable dewpoint is limited by frosting on the DX coil. Lower operating cost — especially in areas where the electricity cost is high and the natural gas cost is low. 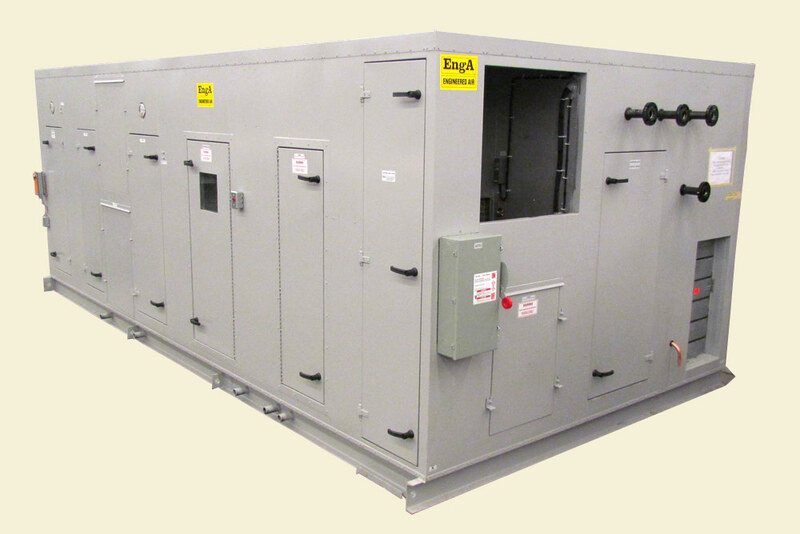 Mechanical cooling compressors require a significant amount of electricity to provide dehumidification. Lower maintenance cost — gas fired desiccant dehumidifier has fewer components to service than mechanical cooling dehumidification units. Mixing boxes can be provided if required. Auxiliary Engineered Air cooling components (FW mechanical cooling or chilled water coil) can be added to re-cool dehumidified process air to neutral condition. A sensible heat wheel can be added to re-cool the process air down stream of desiccant wheel and preheat the regeneration air upstream of Engineered Air's burner. High temperature process exhaust heat (approximately 125°F to 280°F) from the building, steam or electric heat, if available, can be used in the regeneration air to reduce the required heating capacity or eliminate the direct fired burner. A cooling coil (DX or chilled water) could be used as an option to re-cool the warm dehumidified air.